Gothic cathedrals, Spanish cortijos nestled in acres of woodland, five-star contemporary luxury hotels or a sun-drenched intimate beach wedding venues in Spain the possibilities are endless. To make life a little easier for you we have complied a list of the Top 5 Spanish wedding venue choices Sunshine Weddings Spain Bridal couples have chosen to celebrate during 2017 /2018 wedding seasons. 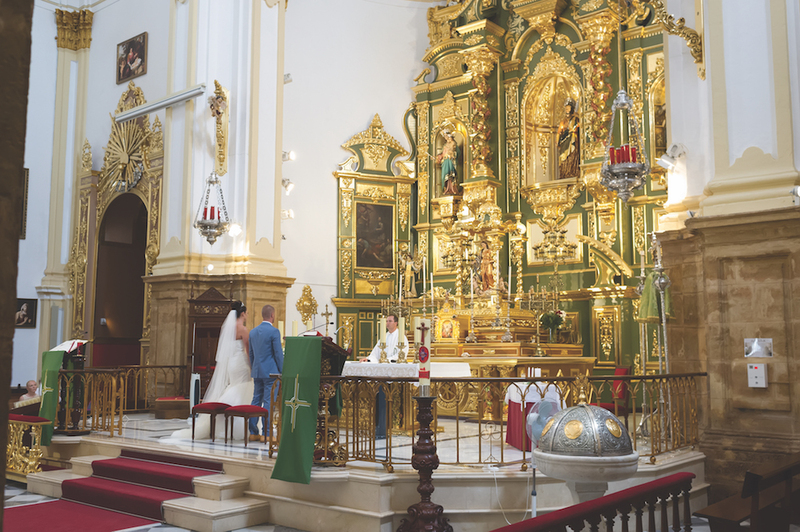 Each Spanish Wedding venue has something special and different to offer. Holding your wedding at a traditional Spanish hacienda allows you to experience the exclusive residential feel, perfect for an intimate gathering or grand celebration. They capture the very essence of Spain’s magical rural ambience, making them perfect for brides who are after a rustic feel rather than a boho beach wedding. The hacienda in Mijas is a striking marriage between old and new. The natural beauty of the buildings and the landscape combine so that gardens and inside venues become the ideal backdrop to ensure the success of your wedding. Combining all the modern day comforts you would expect from a luxury hotel while still retaining the authentic charm of traditional Spain, the hacienda sits among an enchanting 10,000 square metres of gardens with 360˚ panoramic views of the Mijas countryside. This 10-bedroomed house can accommodate 25 guests in spacious surroundings with plenty of space throughout for all guests to enjoy their privacy. The hacienda also boasts a large, stunning bridal suite that leads to a private tower with fabulous views. lf you have always dreamed of a laid-back, simple beach wedding by the sea, then a chiringuito may be the ideal wedding venue for you. Oozing Spanish charm and surrounded by the sea, a chiringuito suits bohemian, toes-in-the-sand weddings perfectly. 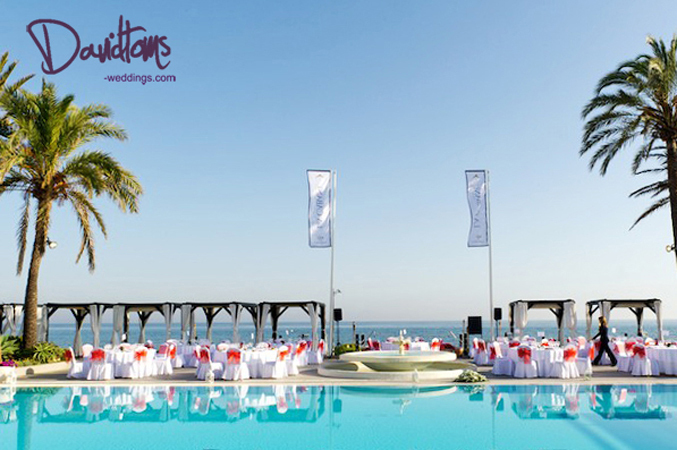 Wedding ceremonies can be held on the beach or on the sun dappled terraces. 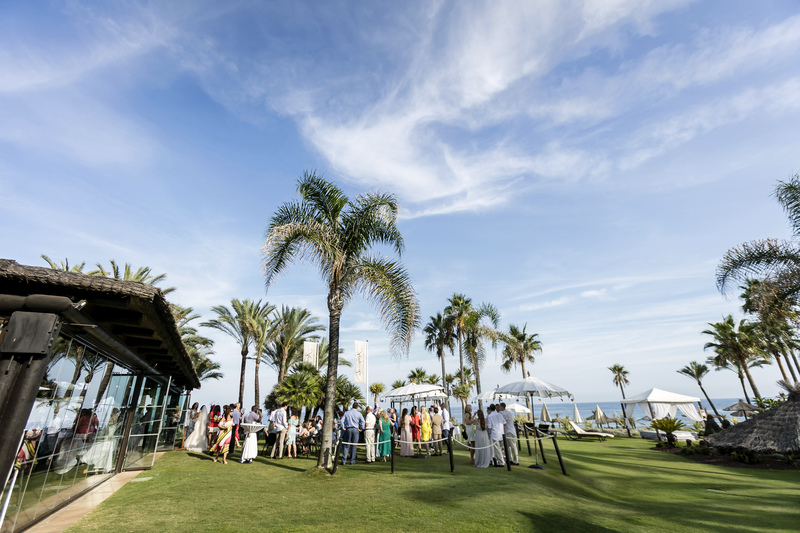 This Marbella chiringuito can accommodate up to120 guests and can cater for everything from pre-wedding drinks and the blessing ceremony to cocktails, a sit-down dinner and dancing long after the sun’s gone down. The only thing you need to take care of is whether you want to be barefoot or in heels – it’s up to you. Celebrate your marriage at a high-end beach club with the infinite, sparkling turquoise Mediterranean as a stunningly romantic backdrop. Dine, party and romance as the sun sets on an unforgettable once-in-a-lifetime event. 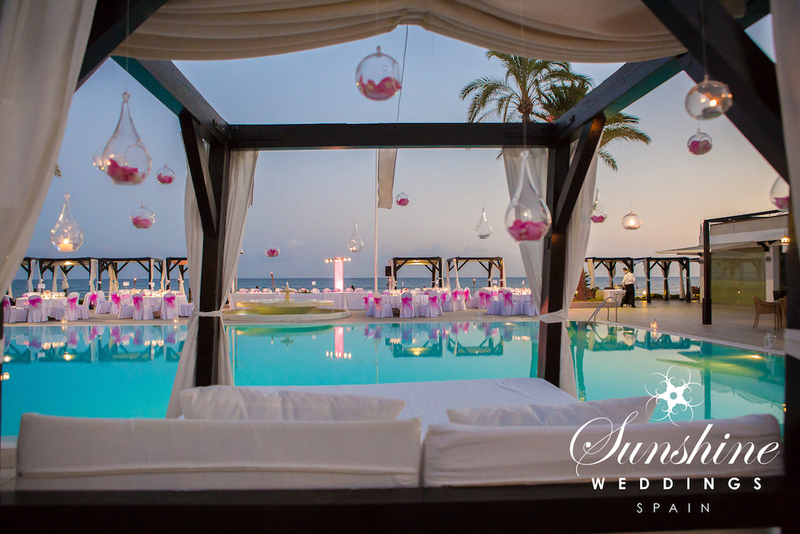 Our luxury beach club in Marbella is a very sleek and modern venue with all white décor and designer furnishing. The views from anywhere in the venue are stunning, making it the perfect place to wed under the golden sunset. With five-star dining and a luxurious space accommodating 250 seated guests the poolside Marbella beach club offers a touch of class to any wedding. Meals take place beneath the stars, surrounded by swaying palms and overlooking the Mediterranean. This beach club is part of a five-star hotel and has over 100 rooms for guests to enjoy. 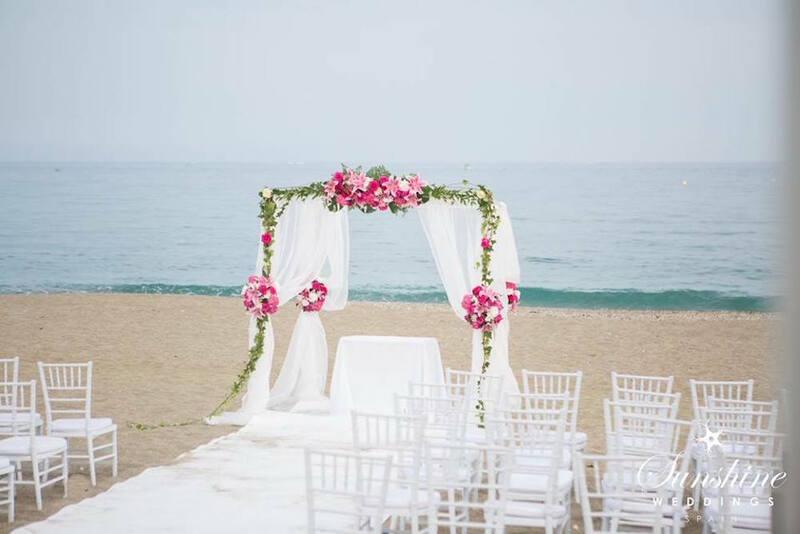 Our five-star beach hotel in Estepona offers you a wonderful frontline beach location with stunning views of the Mediterranean and Morocco, making it a glorious setting for a blessing. The service here is a slick affair and there’s no shortage of space for blessings and receptions. After the vows, celebrations continue with gastronomic dining for your guests. Warm evenings and clear skies mean family and friends can hit the al fresco dance floor until the small hours. If you have always pictured your father walking you down the aisle of a traditional church, then Spain has the answer to all of your prayers. From quaint chapels nestled in the mountains to grand cathedrals in the city centre, there is something for every taste. A favourite church of ours is situated in the Casco Antiguo (Old Town) of Marbella and is considered the main monument of the city. Grand is an understatement; we highly recommend a viewing as it is simply breathtaking inside. Built in the 16th century, giant wooden doors open to show three aisles, the central wider than the lateral ones. Focal points are the gold altar and, of course, the Órgano del Sol Mayor, the most important organ constructed during the last 150 years in Spain.